StarTech.com's Desktop Anti-Static Mat helps you protect your valuable computer equipment from dangerous static electricity. 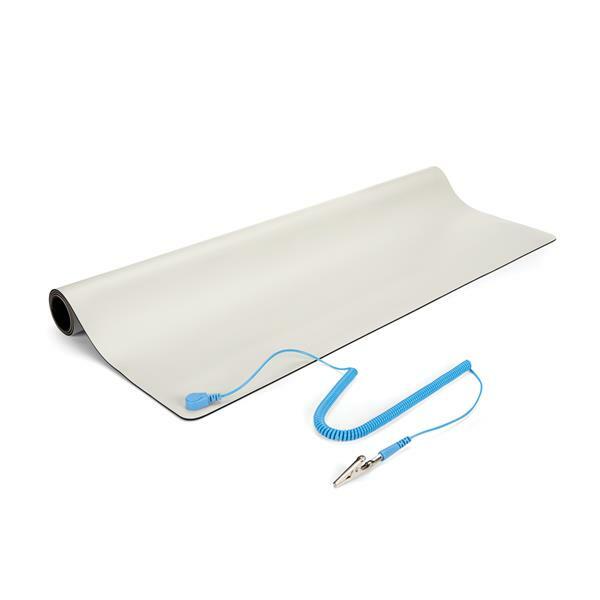 This high quality anti-static mat is constructed from the highest quality static dissipative material, to ensure safe operation of your equipment. The anti-static mat meets IBM and US military static control standards and measures 24x27.5in - perfect for placement under the CPU/VDT and keyboard. It has no directions, and it seems to be very flimsy. I just received it today. We apologize for any confusion surrounding the use of our M3013 Anti-Static Mat. You can find steps for connecting the grounding clip under the FAQ section on the support page for this product: https://www.startech.com/M3013#dnlds If you have any other questions or concerns please do not hesitate to contact us at 1-800 265-1844. It would be helpful, if there were instructions on using this mat. To what should one attach the clip with the 1M Ohm resistor? Me, my PC, or an electrical ground? Does it matter what I touch first after it's attached? Calling support they said attach it to an electrical ground. What is an electrical ground? Electrical ground would be the center pin of an electrical plug, or the center mounting screw on a face plate for an electrical plug.